Overview: Humans are highly visual creatures and we live in an increasingly visual culture. 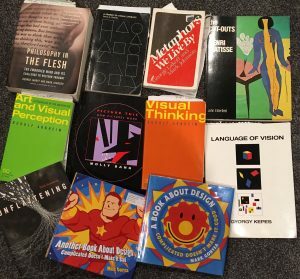 In this course, we will explore what visual thinking means, work to become visually literate, and engage with visual culture. We will look, read, analyze, critique – and we will make – draw, design, compose. This will be a highly hands-on experience – with no prior drawing or design experience expected or required. In engaging visually with our visual world, we expect to open new perspectives on the world around us previously outside our experience. Introduced what we’d be doing, overview of my work and how it connects to goals of course, and then we got to drawing with Grids & Gestures in-class. 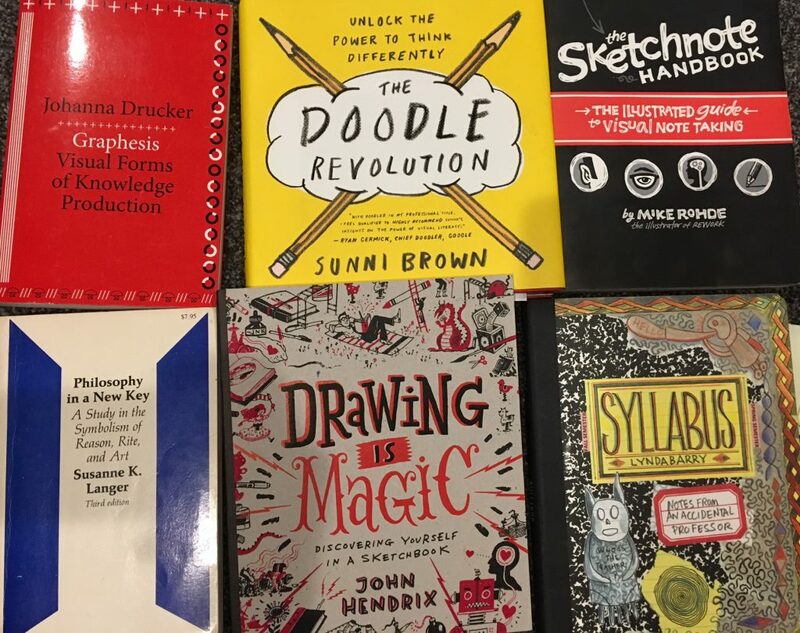 Books I drew on for my slide talk: Johanna Drucker Graphesis, Sunni Brown Doodle Revolution, Mike Rohde The Sketchnote Handbook, Susanne K. Langer Philosophy in a New Key, John Hendrix Drawing is Magic, and Lynda Barry Syllabus. 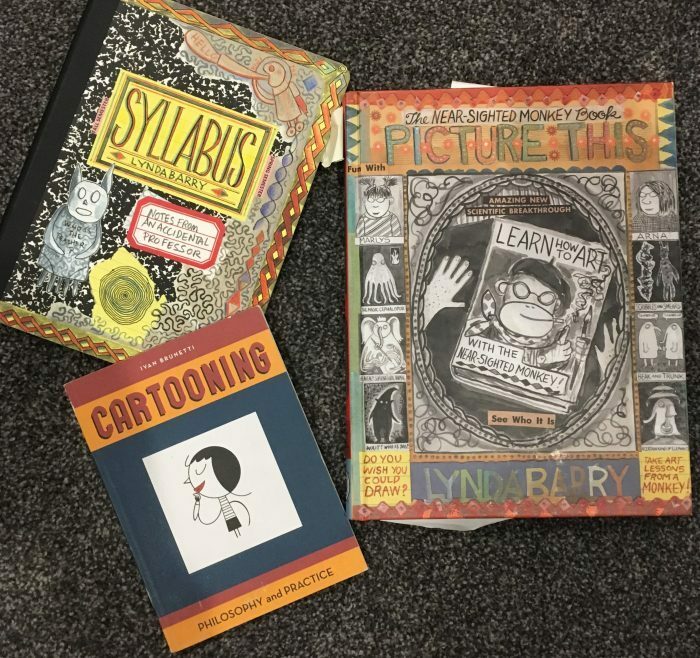 We discussed the longstanding bias against images, the concept of the Gutenberg Parenthesis, and considered the advantages of sketching, sketch-noting, and doodling to enrich our thinking. From Lynda Barry, talked about the magic of a drawing as a place to play – from Sunni Brown, about visual literacy as compared to verbal literacy. Gave them some examples from Mike Rohde on fast ways to draw figures – which they turned in as part of daily work. 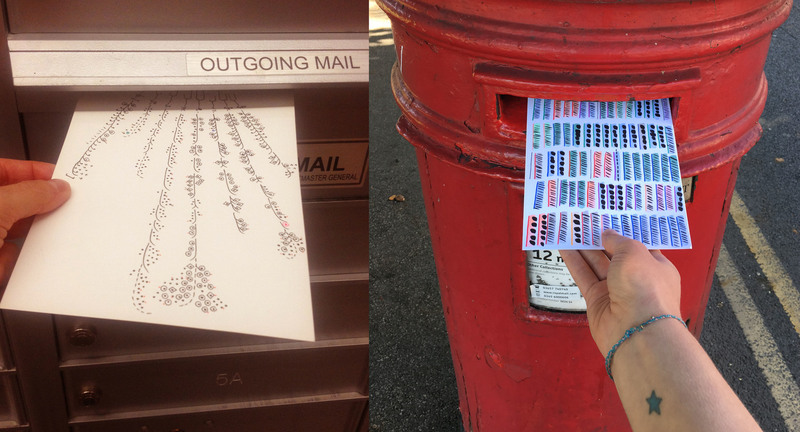 Also played Sunni Brown’s “Doodle Game” – quick prompts to doodle things and share with another. For next class – you will turn in a sketchnote you made in another class (or public talk, or TED talk, something you had to listen to). 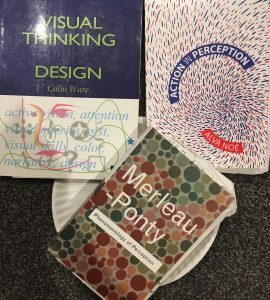 Readings I drew on Colin Ware Visual Thinking for Design, Alva Noë Action in Perception, Maurice Merleau-Ponty Phenomenology of Perception. We also looked at Gestalt drawings. Sketchnote examples from beginners (at Sketchnote Army)! 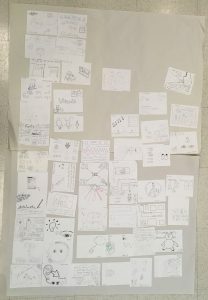 For Next time: upload your in-class sketchnote for Day 3, and then BEFORE class, upload your sketchnote from another class/talk/whatever for Day 4. 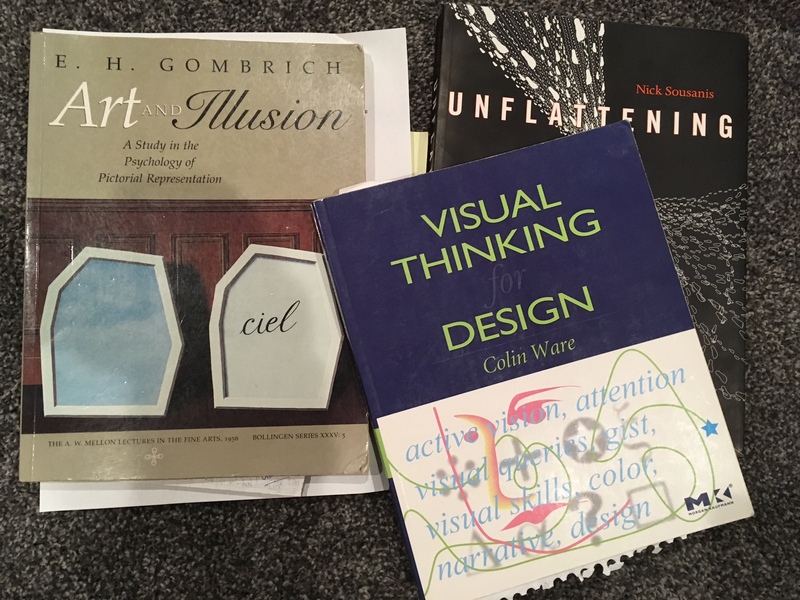 Readings I drew on: EH Gombrich Art & Illusion, Colin Ware Visual Thinking for Design, me Unflattening. Sketching, or the production of untidy images to assist in the development of visual ideas, is one of the oldest and most familiar activities of artists and designers. Sketching is conducted both to clarify existing ideas and to develop new ones. suggest that sketches “contain selective and fragmentary information” (p. 119), “deliberate or accidental indeterminacies that are important to their function,” which “preserve alternatives” (p. 120), and use “denotation systems that include tolerances and indeterminacies in ways that can amplify the artist’s ability to perceive or imagine many options” (p. 117). From Goel: He found that because freehand sketches in the early design process are “dense” and “ambiguous”, they work well for crystallizing design ideas. Goldschmidt observed that there are two ways of inspecting sketches, i.e. 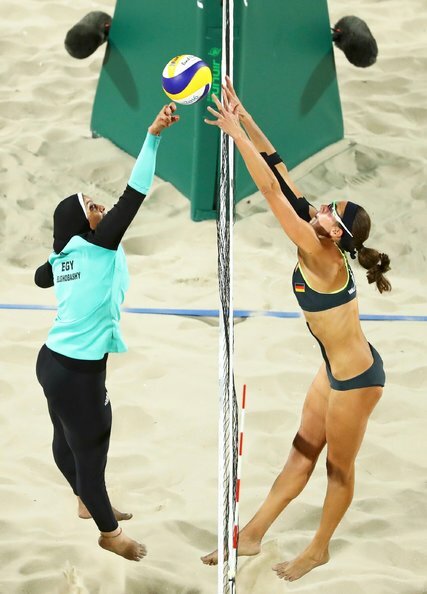 “seeing as” and “seeing that”, and that the former is an especially powerful means for what she calls interactive imagery. We then looked at Harold & The Purple Crayon, the generative process of my sketches to make a comics page (see here), before turning to Austin Kleon’s Tea Bag Drawings: http://austinkleon.com/tag/tea-drawings/. 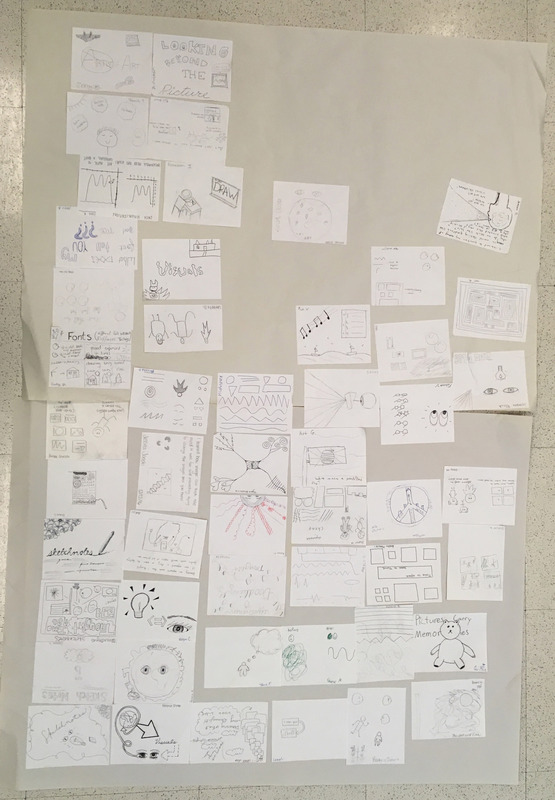 In class, we did crumple-drawings (crumple a sheet of paper and then flatten it back out and draw into what you see in the crumples) and an exercise where a partner scribbled on your sheet of paper, and then you found things in it. For HW, they were to do Kleon’s stain/tea bag activity. This led to looking at Serge Bloch Big Adventures of a Little Line, Klee, and Munari’s play with lines, as well as Kandinski. Then we did Grids & Gestures again to set up the next activity. 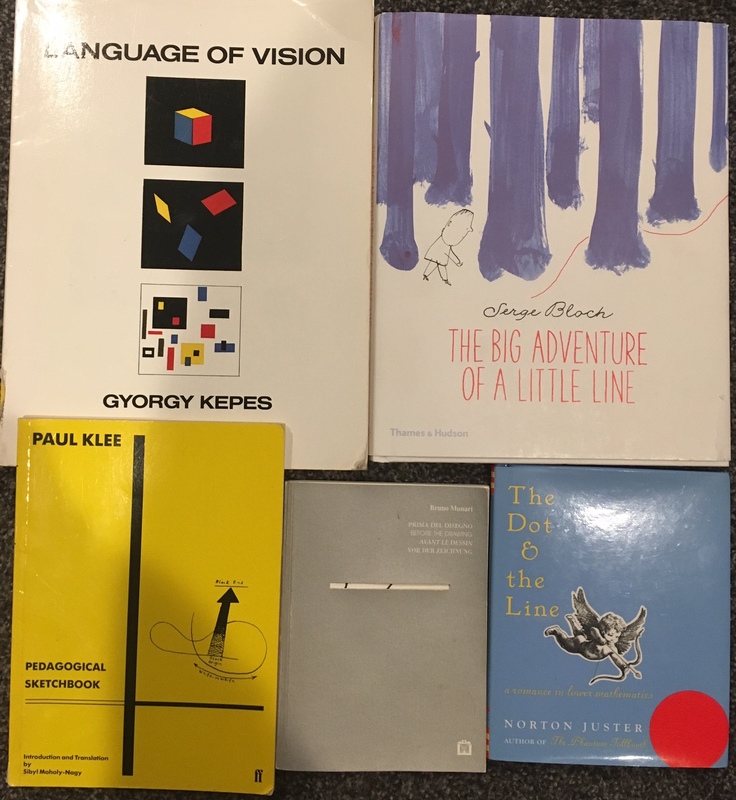 We looked at our Grids & Gestures, and used what we’d done to set up a discussion of embodied thinking and Metaphor – looking at Lakoff & Johnson and “happy is up” among other things. 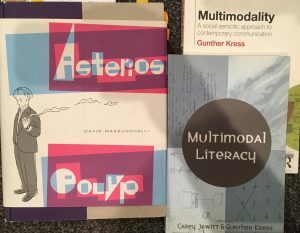 Looked at some examples from Arnheim (“all perceiving is also thinking” and “to see is to see in relationship”), before looking at Gonyea’s design examples, which led to Molly Bang’s Picture This, which i feel gets at Arnheim’s work in a way that is instantly accessible and profoundly sensible. This is all to get at the idea that drawing is a way of seeing, and thus a way of knowing – thus grasping experience. This set up the cutout exercise – “relationship cutouts” – where using colored construction paper they cut out shapes and arranged them to express some relationship that was important to them (between another person or pet or group, an institution, between two people that weren’t them, etc….). For homework, they would continue that by making cutouts around a few self-chosen abstract concepts. Response Gallery 9: choose 4 words – concepts/ideas/abstractions – and respond to each word with cutouts. Post a picture of all 4 along with the word, and some brief explanation of what you did/why? Day 7: I See Faces Everywhere or Why Do Pictures Work? Here i looked at the idea of why drawings work – why do we see faces in things? Töpffer dealt with this long ago, McCloud hits on it. We look at examples of the I see faces everywhere meme photos. Did Colin Ware’s “Boids” exercise – drawing a curlicue squiggle and then turning it into a bird with the addition of one triangle and one dot. We talked about the simplicity of Peppa Pig – how little there is there, and how quickly we accept the cartoon as a huggable friend. And then got into issues of the uncanny valley. Wrapped with returning to the cartoon image, why it works, and McCloud’s triangle. We began with a history of comics – from Paleolithic to illuminated manuscripts to the first use of the word “cartoon” with Punch Magazine. Then turned to talk about the live-ness of a drawing, looking at Lynda Barry’s text to get at this. Reviewed the simple way to make people, and did Ivan Brunetti’s eyebrow drawings. Finished with Brunetti via Barry draw Batman in 3 minutes, then 2 minutes, then 1, then 30 seconds, then 15, then 5 exercise. Did the same for a car, and other things. 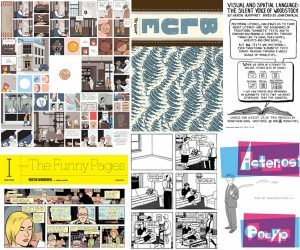 Response Gallery 12: Make a four panel comic (either a horizontal strip, or a 4-box grids) using simplified characters ala our drawing exercises today. 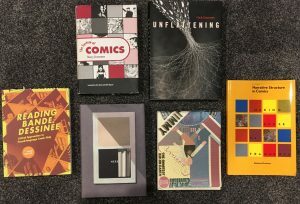 Post with a few words about its creation..
Began with a quick look at comics history from the 1800s to now (way too much!). 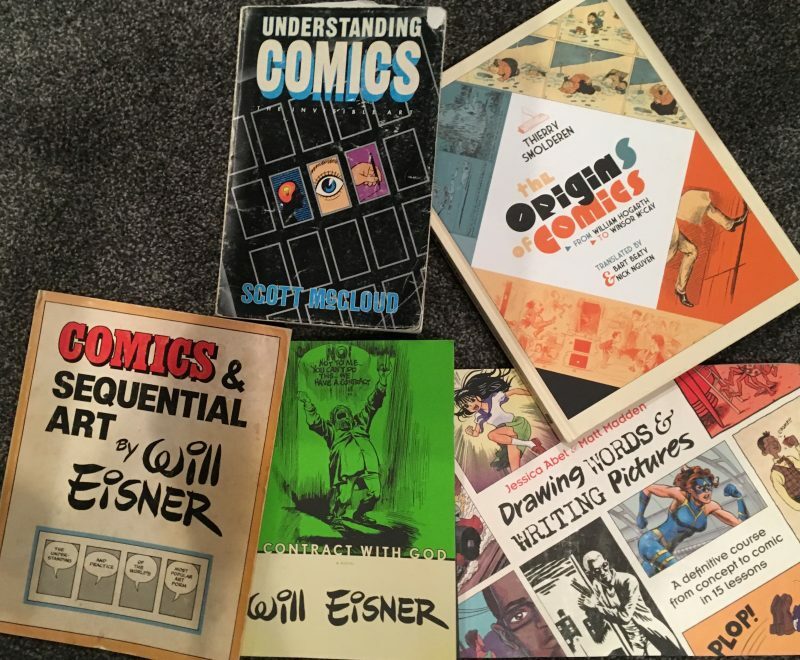 Then to talking sequential art via Eisner and McCloud’s definition of comics. A discussion of space, time, and simultaneity in comics. Talked about how time unfolds in space in comics, the concept of simultaneity from Groensteen, and my take on it in Unflattening. For next time, read Asterios Polyp – all of it. We’ll be discussing Monday and Wednesday. Pick a single page from it that you do a rough redrawing of and then diagram and provide some notes and analysis of the page all over it/around it. This will be due to be uploaded Monday before class and used for discussion. Response Gallery 15: Pick a single page from Asterios Polyp that you redraw and then diagram and provide some notes and analysis of the page all over it/around it. Post it here before class on Monday with a few additional comments/questions about the book. Identify 3 instances where Mazzucchelli uses the visual to create his conceptual meaning. For example as we discussed in class – the word balloon shouting “Hey!” done in the style of the Metro card logo and lettering – so it’s clear it’s stemming from an MTA employee even if you never see one, or the conversation between Asterios and Hanna at the end, where as they get more comfortable with each other, their word balloon tails start to mingle and intertwine. So – pick 3 of these from the book (they could be small details or the way the whole page composition reads), redraw them simply, and then label these 3, post a picture of them here, and briefly type up for each of the 3 an explanation of what he’s doing/how he’s using the visual. You should have one picture and 3 brief descriptions to accompany your redrawings. 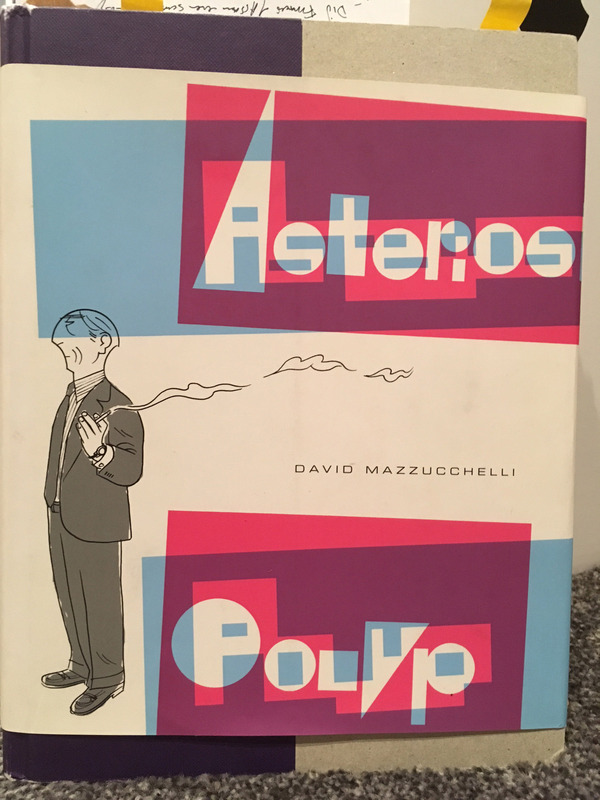 Response Gallery 17: Quick Analysis – Identify 3 interesting instances from the short comics readings posted for this week where the author does something very purposeful with the visual to create conceptual meaning, as we did with Asterios Polyp. Again, redraw them simply, and then label these 3, post a picture of them here, and briefly type up for each of the 3 an explanation of what he’s doing/how he’s using the visual. You should have one picture and 3 brief descriptions to accompany your redrawings. We will share and discuss the things we created that try to picture what our thoughts look like…. Should be fun! 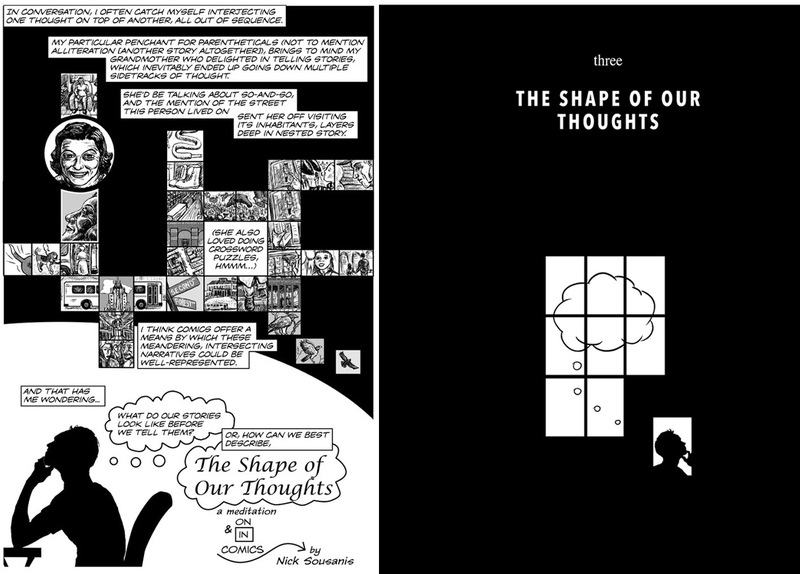 I reworked some of this for Unflattening to do a chapter with the same name – excerpt here. Response Gallery 19: The Shape of Your Thoughts – post an image(s) and brief text description of what you came up with in terms of what your thoughts look like. There is no right answer, one hopes it will simply give you all more ideas for how to think about thinking in seeing and sharing everyone else’s depictions. 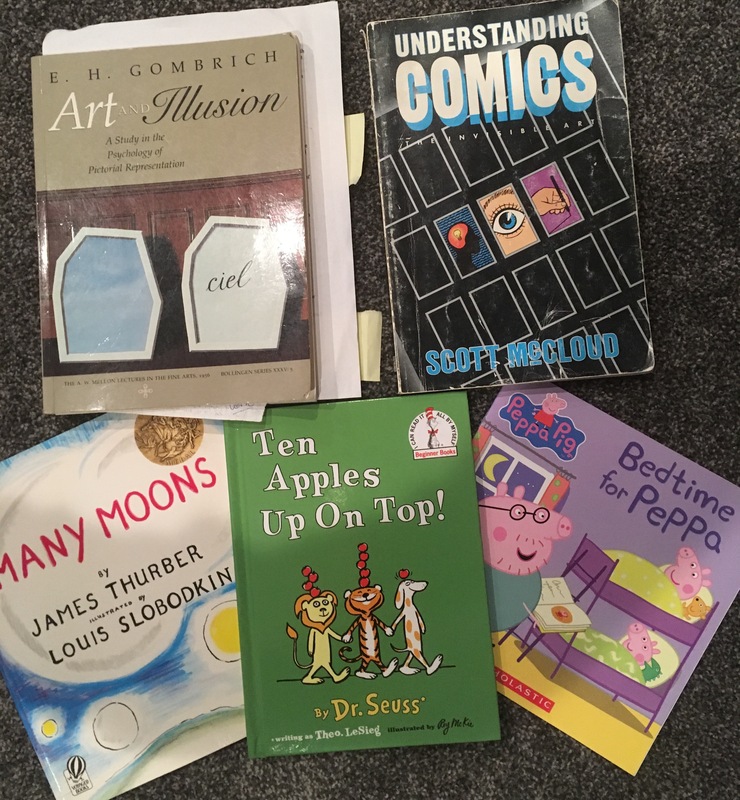 Also, bring physical piece to class to share – we will be discussing. Looking forward to whatever you come up with! Learn more about Dr. Kantrowitz’s painting and research here and here for her thinking through drawing organization. Response Gallery 20: Visual analysis/annotation project: Choose a single comics page from those provided (See here) along with a comics page of your own choosing NOT from our readings to visually annotate and analyze. Redraw, trace, print, or photocopy your pages, and then annotate them with notes and diagrammatic elements. Draw directly on the page, and explain the effect of the various stylistic and other creative elements. Offer analytical commentary in regards to the creative decisions being made, and what they do to your understanding of the comic. We want to emphasize observation and what you can deduce from everything you have observed. 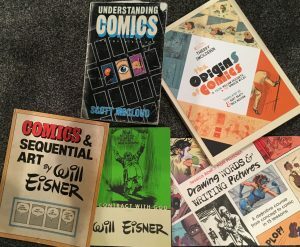 This should help you think about the construction of the comic—how is it made, why is it made in this way, and what is the effect of it being made this way? I want to emphasize visually engaging with the comic and working right on top of it – and letting those visual discoveries guide any commentary you come up with. Special guest RJ Andrews introduced us to concepts in Data Visualization. See more about his work at his site www.infowetrust.com. 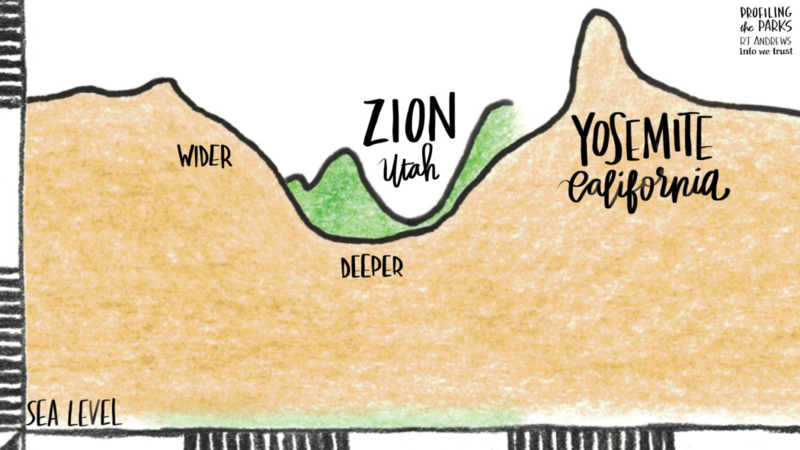 Check out his recent tribute to the National Parks in Data Stories. I really wanted something students could do hands on in class and that led to discovering the Dear Data project (which is now in book form). We also collected a data set from everyone by looking at their commutes – time, distance, mode of transportation, frequency – and they went home to map out in their own way, the classes’ commute. in class we created a data set from all of you. I’ve given it to you as a table. Explore it, play with it, find something you want to bring out through a data visualization, and post an image of that here. Think about the core principles: position, color, shape/size, and labels. Use all 4 categories. It should have some sort of key that helps us understand what you did, and with the text here, provide some explanation of your thinking so we can see why you did what you did. Some words about the Final Project & Proposal – see below for lengthy explanation. We will discuss in class. Proposal is due next Monday 11/7! Final project – an intense examination of your choosing that addresses something with visual communication or visual culture. 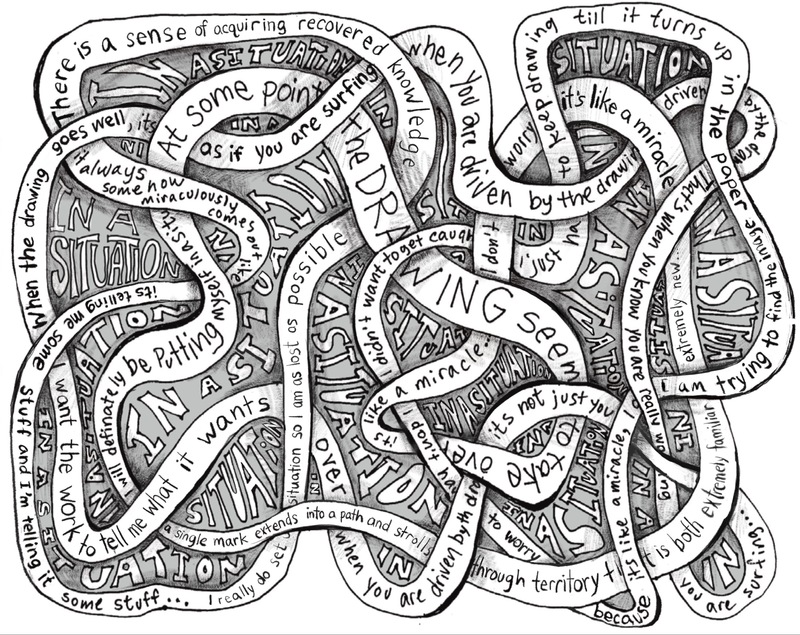 You are invited to do this in a visual form, but you may also do it as a traditional essay. 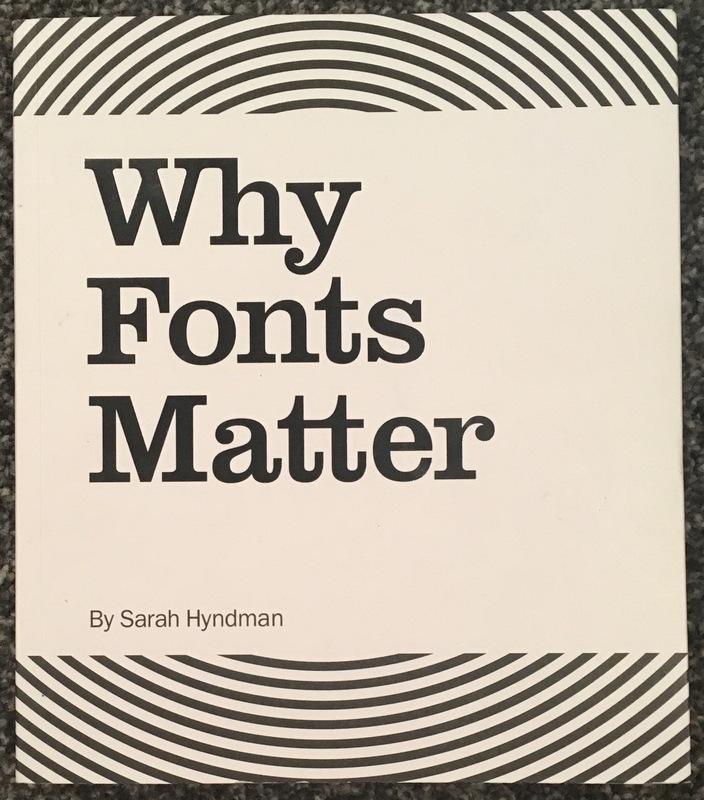 Whether project or paper, what matters most is that it incorporates what we’ve done over the term, that it demonstrates that you brought to bear your creative and critical attention to it, and is meaningful to you. Topic and format will be discussed in class and approved in conversation with the instructor. To this end, before you begin the final project, you will be required to submit a formal proposal outlining your intent and the form the project will take. 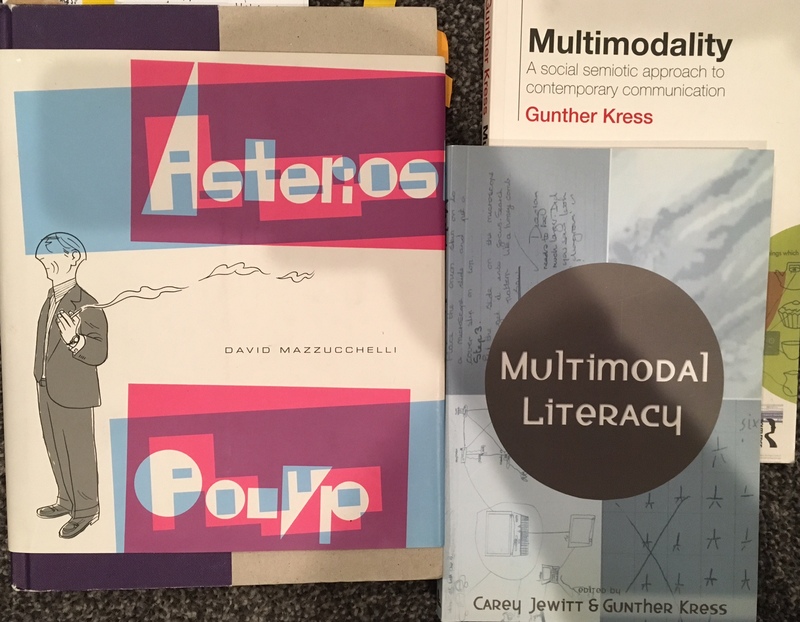 Proposal/pitch: The proposal must be between 100-150 words long, can include any accompanying visual or other information to make clear what you have in mind, and should clearly state how your project relates to course material. Finally, it should indicate the working thesis or aims of your proposed project. Input from cohort and review by instructor will shape revisions – upon which student will receive approval to proceed. For those doing a project in a creative format, your project needs to address course material in some fundamental way. That is, your project should indicate an advanced understanding of what we’ve explored over the term. In addition to your project itself, you are required to submit a short reflective essay 500-1000 words long that outlines your motivations and aims for the project in relation to the overall course content. If you choose to do it as a traditional paper, you will draw on what we have learned to write a traditional analytical essay of 1500-2000 words. 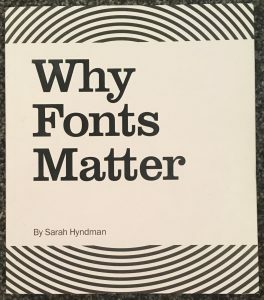 Your essay should have a clearly-outlined thesis—that is, it should have an argument, and be an attempt to convince the reader of something concerning the topic in visual communication/culture you are addressing. Final Gallery Tour: On the final regular class period, December 14, everyone will showcase a visual summary – essentially a small poster – of their final projects. We will discuss specifics of this activity over the term. Final projects are due by noon on Wednesday December 21. 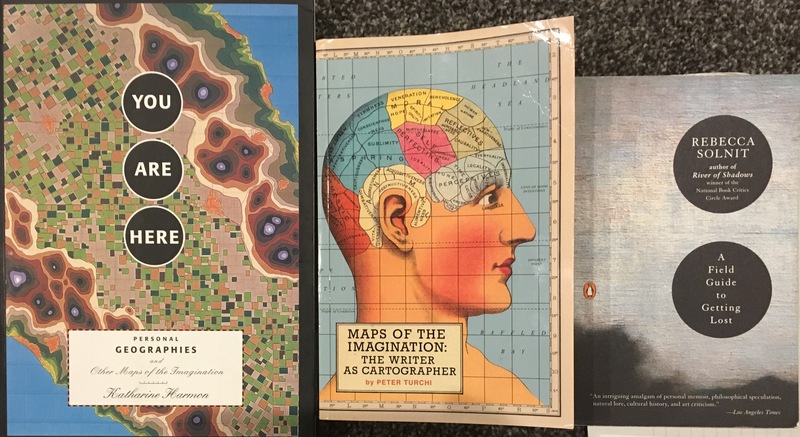 Continuing to talk Data Visualization as Make the invisible visible – sift through the overwhelming complexity all around us, and derive patterns, meaning. Look at the network graphs of Mark Lombardi before turning to Maps. We looked at maps of all sorts, talked about why North is up – and what that means, shared Pacific Islander stick charts in contrast to gridded maps. Ended by looking at Denis Wood’s local maps and other mappings of oddities and left them to try their own. In the class we will spread out your Dear Data and personal Mapping projects on the floor and share and discuss with one another for the period as we did with the Shape of Our Thoughts assignment. Please upload both to iLearn below, but make sure to bring your PHYSICAL drawings/objects to class in order to see them all together. Response Gallery 25: Final Project Proposal, post your 100-150 word project proposal – including description, format, relevance to class, importance to you – here, with accompanying visuals if needed. 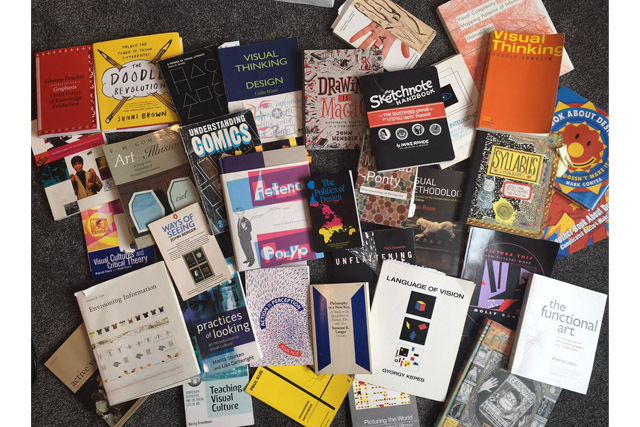 Response Gallery 26: Dear Data Projects – post images of your Dear Data project – both the key and the visualization of it here, along with a few notes about what you learned in doing it. Links to the inspiration for Dear Data are all listed on Day 18 on iLearn. post an image of the map you made with its key, and write a few words about what prompted this, what you learned in doing it. Personal Mapping Overview: Choose some feature in your neighborhood, building, route to school, whatever to feature and map. It could be gum on the sidewalk, broken lights along the road, flower you see along your way – anything to strikes your interest. As with the data visualization project – it’s not just quantifying it, it’s finding the story. As Peter Turchi wrote “To ask for a map is to say, ‘tell me a story. '” Make something visible that is usually hidden about your experience by eliminating the extraneous information around it. 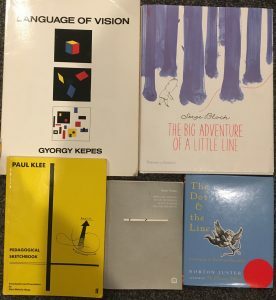 Some Readings i drew on: Nicholas Mirzoeff How to See the World. We then looked at the history of selfies, how selfies differ across the globe, and their own thoughts about selfies. To prep for your own selfie project – see the Selfie City Project and Selfie City Interactive Exploratory – and play with their data to inspire you for ideas for exploring your own network…. This is your chance to invent an assignment, maybe something you do will trigger ideas that we all look at as a class. 1) Explore SelfieCity Project and try a few things on the interactive part of their site. Post a quick reflection on something that surprised you, you didn’t expect, found interesting. 2) Thinking about SelfieCity – look at your own social network. See if you can find some interesting patterns, observations about the way those in your network take selfies. 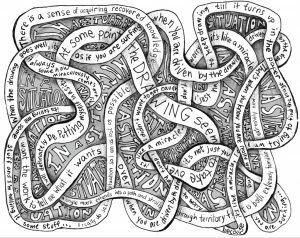 You can map this out visually if it helps – and/or write some words about two different observations you made. 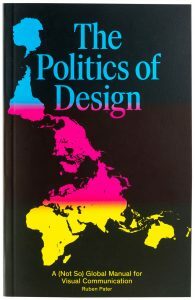 Response Gallery 29: The Politics of Design – select a favorite section from “The Politics of Design” and 1) reflect on that here: What caught your interest, what it made you think of, list the pages it came from, etc. 2) Find some visual examples that relate to this reading and share both the images here as well as some reflective comments about them and their connection to the example in the book. More on the Politics of Design, photoshop and “fake news”, and then, Discussion of Unpleasant Architecture from park benches to window sills. 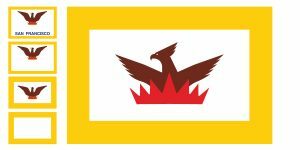 Redesign Pocatello’s Flag – contest till December 2! Response Gallery 31: in-class Flag Project post an image(s) of your city flag, and then write the name of the city, if it had an existing flag (maybe post a picture of that one as well) and describe some of your decisions for color and design…. 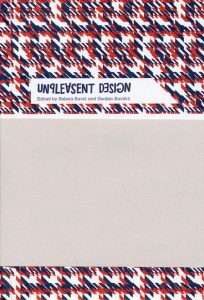 We will share our Special Projects related to The Politics of Design as well as our Unpleasant Design documentation…. 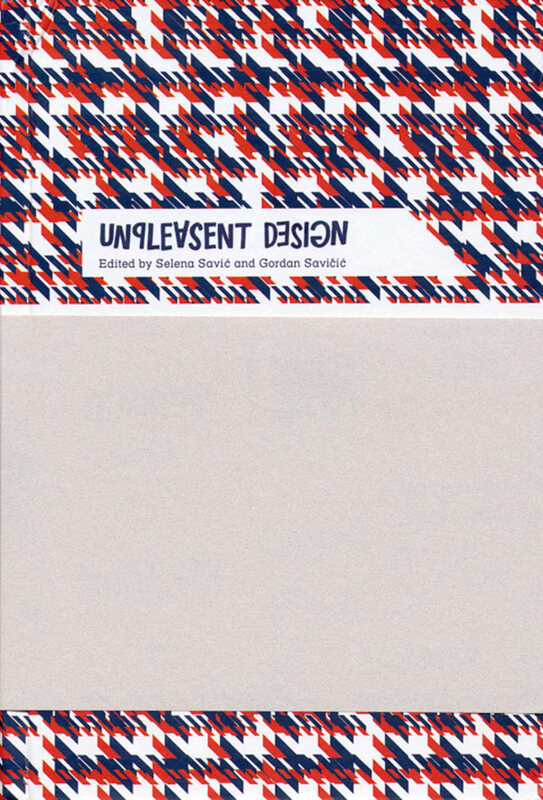 Response Gallery 32: Politics of Design – pick a page/section/idea from The Politics of Design as a jumping off point to make your own small exploration into a related topic. Pretend YOU are making another page or two that could be included in the book. 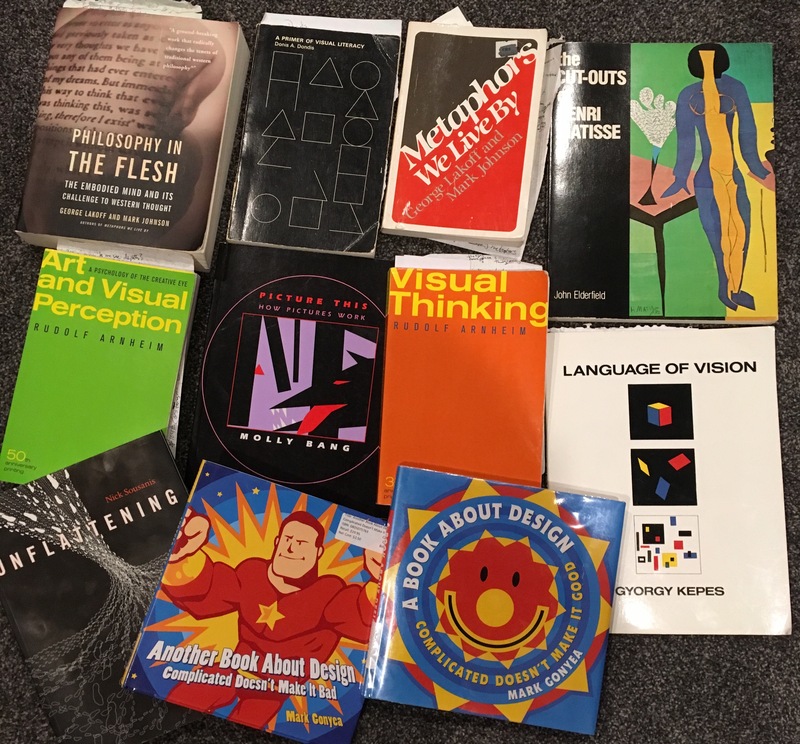 This will mean a relative brief writeup – around 250 words or so – that begins with acknowledging what part of the book got you curious and then discuss in some depth what you are exploring and include at least 3 visual examples. (It could be a single picture that has multiple images in it – as with the sports mascot page in the book). Your goal, as is the goal of the book, is to make us look at something we may take for granted in the world around us and get us to see it in a new way, to question our assumptions about things as they are, and see how much the visual world has an effect on our thinking. Have fun with it! Response Gallery 34: Logo/Mascot Evolution – look for images of the mascot or logo of a sports team, university, or corporation – and find three images of its evolution over time. See for instance the evolution of the UConn Husky: http://today.uconn.edu/2013/04/a-new-husky-for-a-new-era/ or look at the Gator at SFSU – and its recent renovation (which was almost a replacement). Whatever you find, post 3 images, and a few words of speculation as to why this particular team/institution revised its logo/mascot over time. 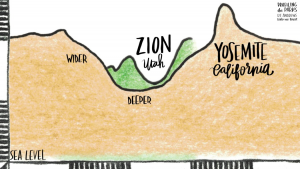 Day 29: Recap and …. Response Gallery 37: Final Gallery Tour: On the final regular class period, everyone will showcase a visual summary – essentially a small poster – of their final projects. Post an image or images here, with a quick summary.